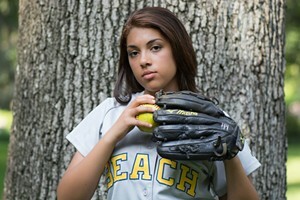 This year may not have been a championship run for the Beach High Bulldogs softball team, but for senior Jasmine Bigham, just being on the field made it a winning season. “Playing on the Beach team has given me a whole other family. We all have each other’s backs and know we can turn to each other when we need help,” she told the One Moment One Shot photography blog earlier this year. The star athlete shines off the diamond as well: She was recognized as Beach’s 2015 STAR student for having the highest SAT scores in this year’s graduating class, with a cumulative total of 1850. She plans to major in Biology at college next year and has designs on a medical career as a reconstructive surgeon. “I really want to do something with my life that I can be proud of. Helping people with some sort of deformity feel beautiful again will bring great feelings of joy and success to my life,” says the academic athlete.